Judge Neil Gorsuch’s Supreme Court nomination was sent to the full Senate on a party line vote Monday. WASHINGTON — The US Senate lurched toward another milestone in partisan warfare Monday as Republicans appeared increasingly likely to wipe away decades-old filibuster rules in order to secure confirmation of President Trump’s nominee to the Supreme Court, Judge Neil Gorsuch. On an 11-to-9 party line vote, the Senate Judiciary Committee on Monday sent Gorsuch’s nomination to the Senate floor, where it is expected to be met with staunch opposition from Democrats. More than 40 Democratic senators announced that they intend to filibuster the nomination to prevent it from coming to a vote on the floor — a move not seen for a Supreme Court nominee in half a century. In response to the Democrats’ posture, Senate Republicans, with the backing of the White House, are poised to use what’s called the “nuclear option,” a change in Senate rules that would lower the threshold required to end a filibuster to a simple majority. With the rule change, the Senate Republicans could vote to end debate with just 51 votes instead of the traditional 60 vote supermajority. Republicans hold 52 seats, and they are expected to pull in a handful of Democrats on the Gorsuch vote. The highly partisan maneuver is a reflection of the partisan nature of the Senate in this era. “It’s a reflection on brokenness of the US Senate,” he added. The rule change would not affect the ability of senators to filibuster legislation. But it would further erode Senate rules intended to encourage consensus and collegiality in considering a president’s nominees. When Democrats had the majority and ran the Senate in 2013, they eliminated the filibuster for Cabinet officials and nominees for lower-court judgeships, so they could be confirmed with just 51 votes. That move benefited President Obama, who complained that his lower-court nominees were taking too long to be confirmed. A filibuster of Gorsuch, whose background includes Harvard Law School, Oxford College, and a decade on the US Court of Appeals for the Tenth Circuit, exposes the Senate as so mired in partisanship that it can no longer operate under the traditional rules. 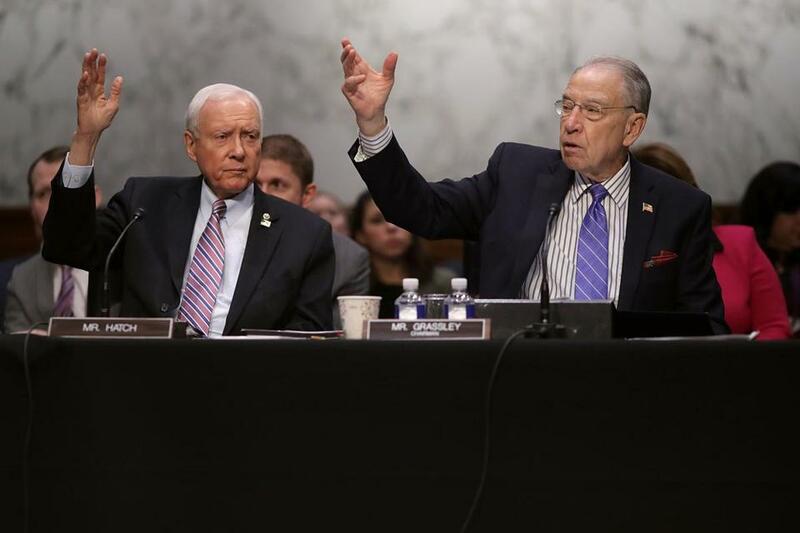 “If the Democrats will filibuster this person, of the quality that he is, there isn’t any person that a Republican can put forth who they would support,” said Senator Orrin Hatch of Utah, a Republican member of the Judiciary Committee. Hatch, who has served in the Senate for more than 40 years, said the actions of Democrats were “unworthy” of the office. “I’m very disappointed in my colleagues to politicize this in the way that they have,” Hatch said. Lindsey Graham of South Carolina, the longtime Republican senator known for his colorful language, said Alexander Hamilton, one of America’s founding fathers, was “rolling over in his grave” at the Democrats’ behavior. “Our Democratic colleagues will not accept the fact that President Trump won. He did. And when you win the White House you have the ability to appoint people to the Supreme Court,” Graham said. Senator Ted Cruz of Texas, another Republican on the Judiciary Committee, said Republicans have “no choice” but to change the rules. A vote to end debate on Gorsuch — called a cloture vote — is scheduled for the full Senate floor on Thursday. If the GOP promise to change the rule holds true, McConnell will invoke his rule change before Democrats have the chance to block cloture with their filibuster. That would allow Gorsuch to be confirmed by Friday — 429 days after the death of the man he would replace on the court, Antonin Scalia. The partisan finger-pointing went both ways Monday. Democrats remain irate that, for months, Republicans refused to hold hearings for Merrick Garland, the judge that President Obama nominated last year to replace Scalia. In interviews, liberals still refer to Gorsuch’s nomination as a “stolen seat” on the court, which increases the Democrats’ willingness to filibuster his confirmation vote. Other Democrats, including Warren, said payback for stalling Garland was not a decisive factor in the upcoming vote. They pointed to the possibility that the new justice would tip the balance on several key issues before the court. Senator Patrick Leahy of Vermont, who first assumed office in 1975 and voted to confirm previous conservative judges such as current Supreme Court Chief Justice John Roberts, said Gorsuch is extreme. “As a judge, he twisted statutory language to limit the rights of workers, women, and children with disabilities; and he reached for broad constitutional questions that were not before him in order to advance his agenda,” Leahy, the former head of the Judicial Committee, said in a statement. The Gorsuch debate is the latest iteration of a larger trend in Washington — the breakdown of traditions in favor of partisan politics. For years, the Senate, backboned by longstanding members such as Joe Biden of Delaware, the former vice president, Edward Kennedy of Massachusetts, and Ted Stevens of Alaska, held tightly to its reputation as a close-knit governing body where personal relationships could overcome policy differences. Warren said this likely rule change to remove the option to filibuster a Supreme Court judge, would be a devastating blow for bipartisanship in the Senate, and for the ability to craft compromises. She speculated that the change would have long-lasting effects on Senate governance, as did her Massachusetts colleague, Ed Markey. “What we’ve done over our history is to have a 60-vote threshold that is sacred in ensuring a bipartisan Supreme Court nominee. . . . The Republicans are now more interested in an ideological justice and not a bipartisan justice,” Markey said in a telephone interview.